PERIOD APRIL, MAY, JUNE (AMJ) AND JULY, AUGUST, SEPTEMBER (JAS) A DROUGHT WATCH IS IN EFFECT. What influences the next season? El Nino Southern Oscillation (ENSO) Recent observations: In recent months, sea-surface temperatures (SSTs) in the equatorial eastern Pacific (NINO3.4) have stabilised at 0.5°C above average, meaning borderline El Niño conditions. Model forecast and guidance: Most models suggest ENSO conditions to maintain as a weak El Niño during MAM (with 55-75% confidence) and a possible shift to ENSO neutral in JJA (40-50% confid.). Expected impacts on rainfall and temperatures: An El Niño tends to tilt the odds to warmer and drier conditions with less shower activity and a potential late start of the wet season, except in the Bahamas and Cuba. Note, however, that an El Niño surviving beyond April is historically quite uncommon, which brings about quite some uncertainty in this guidance. Rainfall expectations for Aruba: AMJ, around normal; JAS, 80% normal to below normal. 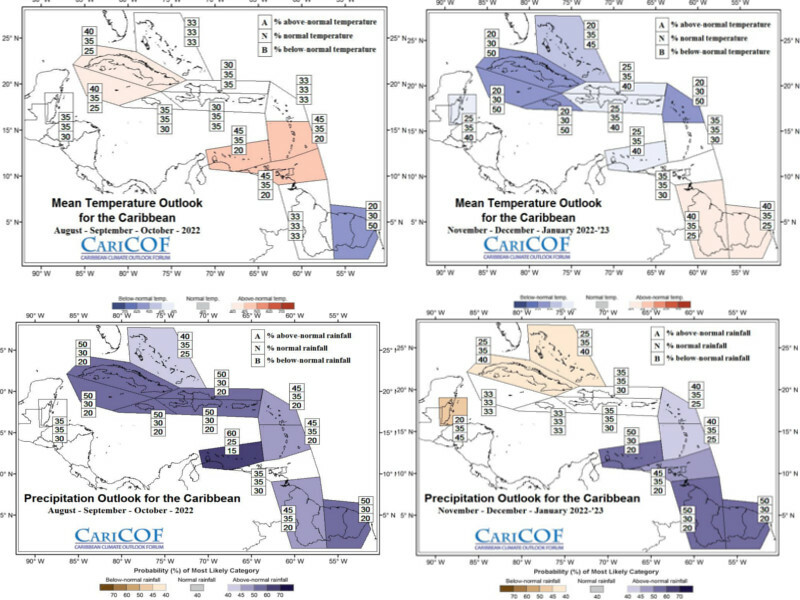 Temperature expectations for Aruba: AMJ, 80% for normal to above normal; JAS, 80% for normal to above normal. Hurricane season for the Atlantic region runs from June 1st through November 30th. Experts expect for Atlantic hurricane activity in 2019 a slightly below normal season. On average we see 11 tropical storms and 9 hurricanes. Keep in mind that even when we have a below average forecast, residents are reminded that it only takes one hurricane making landfall to make it an active season for them. Residents are reminded to prepare the same for every season, regardless of how much or how little activity is predicted.